Expressive soundscapes and atmospheric pads creator. 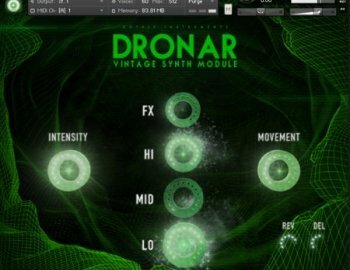 With a retro futuristic vibe reminiscent of the classic 80’s synth from which the sounds were derived, DRONAR Vintage Synth is Gothic Instrument’s sixth module in their critically acclaimed product line of atmosphere creation tools. Transport your audience into an evolving universe of sound, building trepidation, tension, energy and wonder. DRONAR instantly adds low, mid-range and high sounds plus FX so you barely need other sounds or instruments to quickly create a complete piece of atmospheric music. Thanks to Hollywood trailer sound designer extraordinaire, Alessandro Camnasio, the audio in DRONAR Vintage Synth has been edited and processed to present a more interesting and vibrant sound than the original synth delivered. Just press a few keys and DRONAR Vintage Synth will generate a complete universe of rich evolving sounds which can be easily customised using the 6 dials on the main page. This simple process allows you to play and tweak simultaneously for a truly expressive, and immersive experience. Furthermore, DRONAR Vintage Synth features four additional pages of controls, FX and an innovative arpeggiator to really dive in and explore the potential of this revolutionary engine. From light, airy and ethereal to big, bold and dramatic, the sounds in DRONAR Vintage Synth are incredibly versatile for cinematic projects from sci-fi to thrillers to action genres and more. There’s easily a place for them in ambient and electronic music too.